The Oriental Museum was at least a fifty minute walk from my digs. I woke early in order to have a leisurely stroll through town and hopefully take some more pictures. 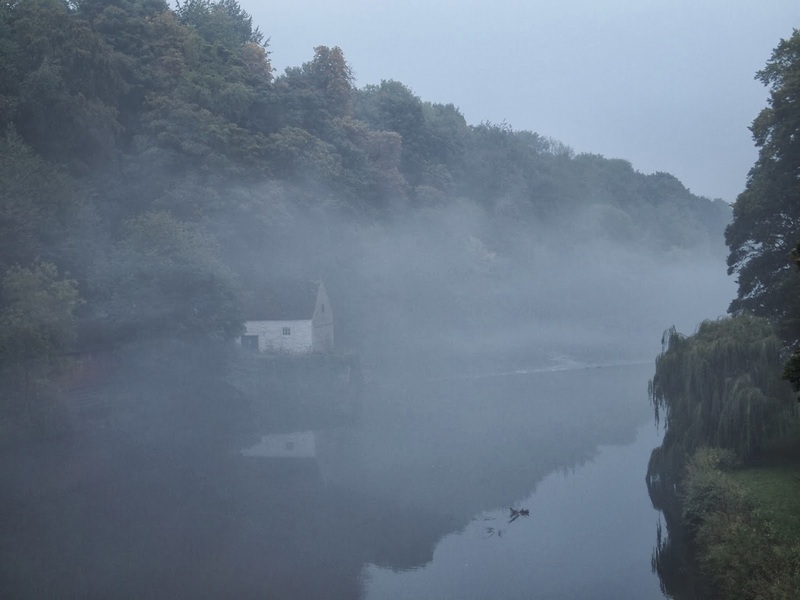 A mist hung about the river and cast an otherworldly feeling throughout the town. As I walked past Market Square I turned up North Bailey. 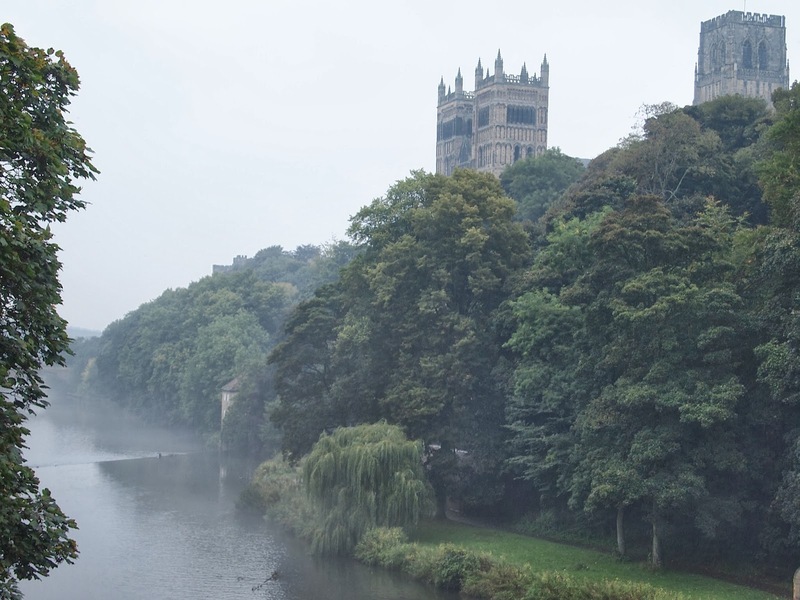 It must have still been early for Durham because the streets were still deserted. I rounded the bend and walked through a stone archway and across Prebends Bridge. This was the spot; perhaps the most picturesque spot from which to view the Cathedral. I stopped and took some more photographs. It was quiet and still. The mist rose from the river and hung suspended in the cool morning air. I stopped for a few moments just to consider my journey up until this point. It was now a lifetime ago that I boarded a plane back in the states to come to England. My life before that moment seemed like someone else’s. It was just as obscured in my memory as the river water under the heavy fog. I tried to brush my mental mist away but my new reality was far too strong at the moment. I was firmly standing there, on Prebends Bridge, looking out over the winding River Wear. That was the truth. The rest was dust and memory. I arrived at the Oriental Museum before Sophie. I sat on one of the red benches just outside the entrance. The walk had made me hot and I sweated underneath my short jacket. I took it off and turned my attention to my phone. I had come to realize in the last week and a half why people were so glued to their smart phones. I had learned how to check my mail, use Google Talk, update my Facebook Status, and text. I know had the perfect disguise if ever I was alone, I could just look, with that very specific focus everyone seems to get when staring at their phones, and no one would think I was loitering or lost. Sophie arrived at the museum and we realized when we checked the hours that we have thirty minutes before it opened. We hadn’t thought to look at opening but thankfully the small café was open and we grabbed a light breakfast and two packets of crisps. The Oriental Museum is a warm and inviting place. It may be the least intimidating museum I’ve ever visited. It appears small at first, but then you realize it reaches down three more levels and it is filled with incredible collections from Egypt, China, Indian, and Japan. The walls are painted a warm mauve and the lighting is low so that you feel wrapped up in its embrace. Sophie and I wandered through the artifacts in cases and marveled at the incredible artistry of jade bowls, ceramic statues, and metal swords. We found a dressing up box in the Japanese section and couldn’t resist a brief photo op. We continued to wander up and down the rows of beautifully painted ceramics and ornately carved furniture. This was the first time I had visited a museum with another museum professional casually. I enjoyed speaking to her about the labeling and displays, the room full of school children running around with a scavenger hunt page. After the Oriental Museum we walked along the river to the Archaeology Museum. Robin had mentioned the collections were moving but we thought it might still be open. Unfortunately we were out of luck. Despite this, the walk along the river was truly incredible. 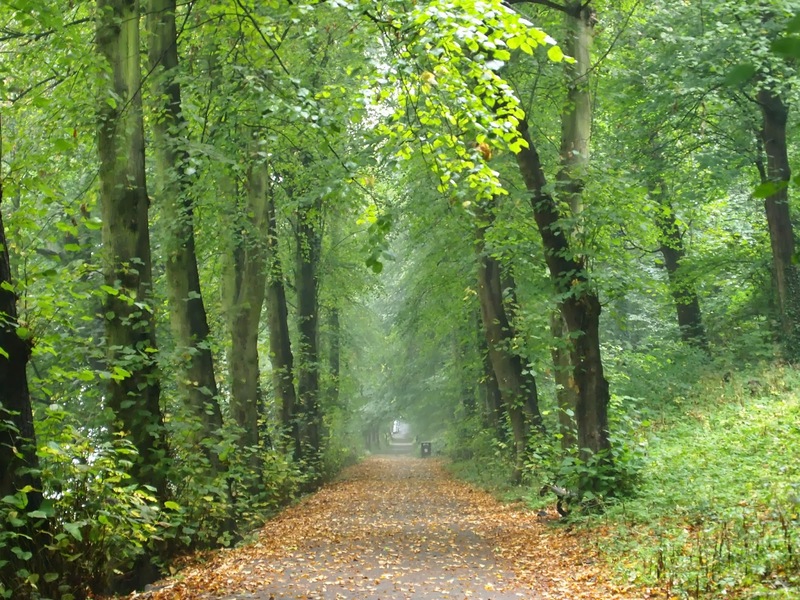 The mist was still hanging over the river and it spilled onto the heavily wooded footpath. 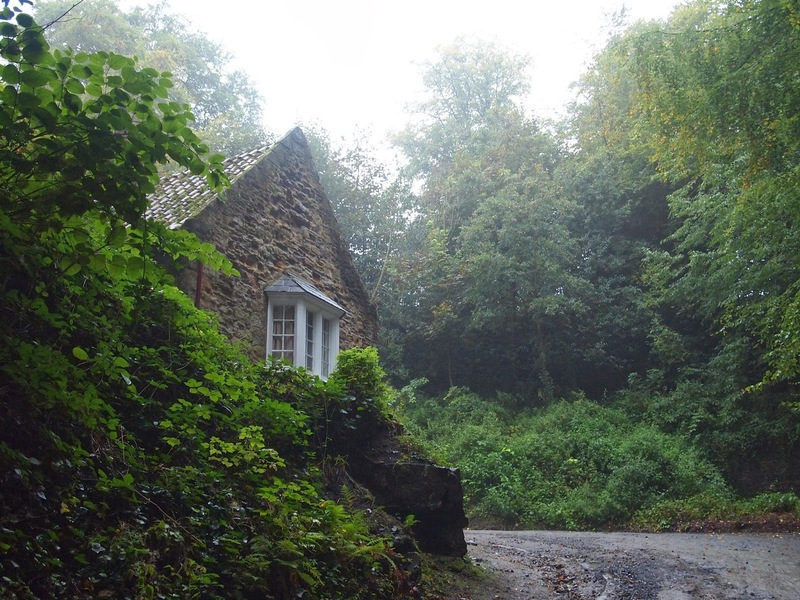 It seemed like a vision out of Tolkien’s Middle Earth or Washington Irving’s Sleepy Hollow. We climbed up to Silver Street and the sound of singing greeted us from the top of the hill where Market Square was. We looked at each other quizzically and began climbing the hill. The singing got louder and louder. I recognized the tune; it was Time to Say Goodbye. We finally entered the square and saw a group of listeners some just standing and taking it all in, some with their phones out recording the improbable outdoor opera venue. Market Square became even more precious to me in those few moments as it suddenly became the place that the most random events could and would happen in. After the performance we continued our walk to Palace Green. Since we had had no luck at the Archaeology Museum we thought we would try the World Heritage Site Visitor Centre. To our profound delight we found yet another dressing up box. Sophie dressed as a bishop and I as a knave. We wondered through the small exhibits and watched a brief video about the Castle and the Cathedral. I couldn’t believe that the incredible images I was seeing on the film were not more than four hundred yards from where I was sitting. Afterwards we headed over to the café and then met Charlotte for a delicious lunch at 9 Altars. We sat outside and talked about our programs and the plans we had for the upcoming year. Charlotte told us about her lectures and how busy she was going to be with all of her work. It began to drizzle so we got up and decided to go to Tesco and purchased wine for the formal dinner that night. After choosing a superb bottle of Riesling (superb in that it was superbly cheap), I went off home to change with the promise that I would meet Charlie and Sophie at ten to seven that night. When I reached my room I had about an hour before I needed to start getting ready. As my new English bank account was still empty, I thought it was the perfect time to wire some money into it from my American account. What transpired was the most frustrating twenty minutes I had since I had gotten to Durham. My bank, in their infinite wisdom had no vehicle for completing a wire transfer from overseas. I was told after ten minutes of being on hold at international rates, that I should have set up the transfer before I left for England. What bloody use is that statement to me now that I’m here! I began to shake with rage and frustration. This was my money after all; money I had saved over the course of four years of agony while I was teaching. I hung up on the woman on the phone. I had wasted enough minutes on her and refused to give her a second more. The only person I could think of who might come up with a cunning plan was my mom. I managed to reach her through Skype and explained the ludicrous situation I was in. We decided the best thing we could do was for me to go to Lloyds and see if they could do anything to help on their end. Skype is a truly wonderful thing. While I was chatting with my mom, well she was chatting and I was typing since my internal microphone refused to work, Chase had woken up. She held him up so that I could see him and for the first time since I arrived in Durham I got to see the furry friend I was forced to leave behind. Poor Chase had no idea what was going on. I knew he couldn’t see me on the screen and since my microphone wasn’t working there was no way for him to hear me. Lamborghini had woken up, too, and it was his turn next. I was missing them so much. I realized I had been kept so busy in the past week and a half that I hadn’t had time to miss them before. I wished I could cuddle them up and feed them treats and play with them. Too soon it was time for me to get ready for the formal. I said goodbye to my mom and closed my laptop. After a hot shower, I pulled on my black and red cocktail dress and tossed on some uncomfortable shoes. A shuttle bus had been arranged to take the residents from this distant land down to Howlands. I arrived at 6:30 and slowly made my way in my heels to Sophie’s room where she was getting ready. Elena, Trish, and Charlotte knocked on the door ten minutes later and then part of the Magnificent Seven were making their way to the formal, wine bottles in hand. When we arrived, we looked at the table assignments and learned to our pleasure that we were Table 1. 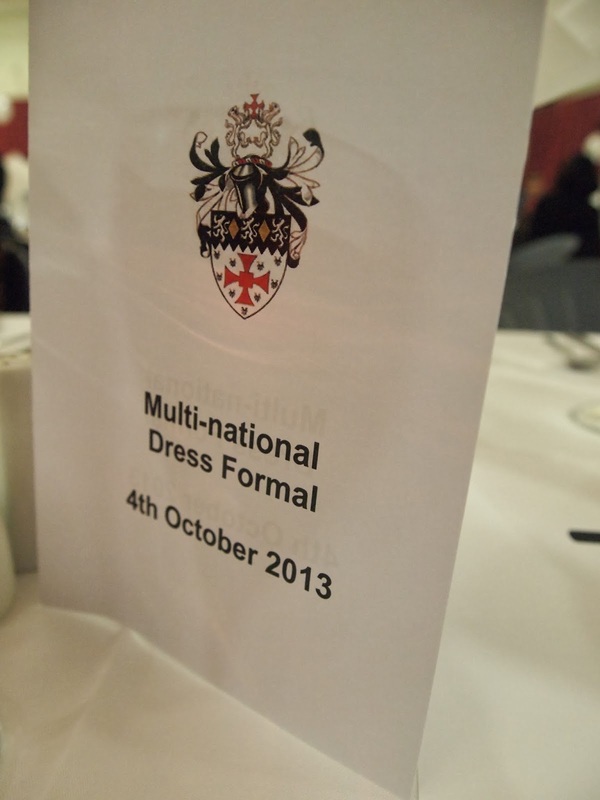 We pretended to be very important as we searched for where Table 1 was situated. We were right next to the head table. We would have to be on our best behavior. Out two other Sophies joined us and Kat, who we had all met on a previous night and we were finally the Magnificent Eight. I think it’s supposed to spell Ustinov. 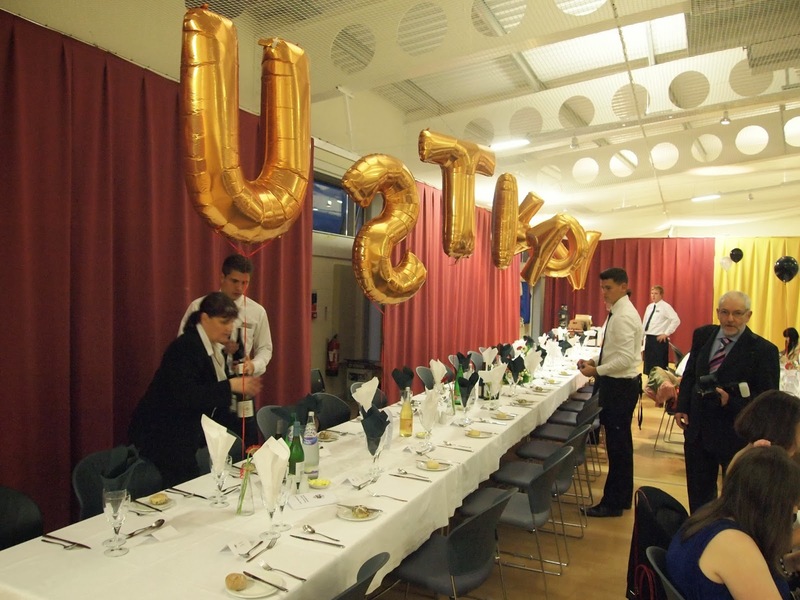 After the head table processed in and speeches were given by the Graduate Common Room President and the President of our college, dinner was served. 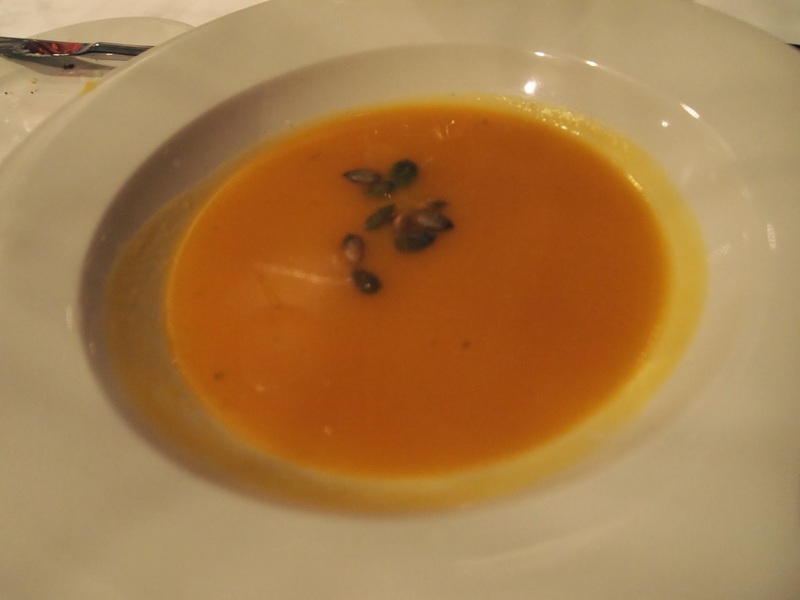 A delicious butternut squash soup was our first course. We began reliving the past week and talking about our plans for the upcoming term. Sophie regaled us with tales from Cornwall and Kat with tales from her undergraduate time at Durham. Apparently in her old college she had once been fined £50 for leaving her table before the head table had left the room. We joked when some of our tablemates got up to use the loo that we expected payment in full. I normally don’t take pictures of food. Our mains came next. The meat eaters received a course of duck, potatoes, and roasted roots in green peppercorn sauce. As a vegetarian I was given giant ravioli with grilled vegetables in tomato sauce with pesto dressing. The wine was flowing freely now. We had each brought a bottle and so we had to do our duty by it. 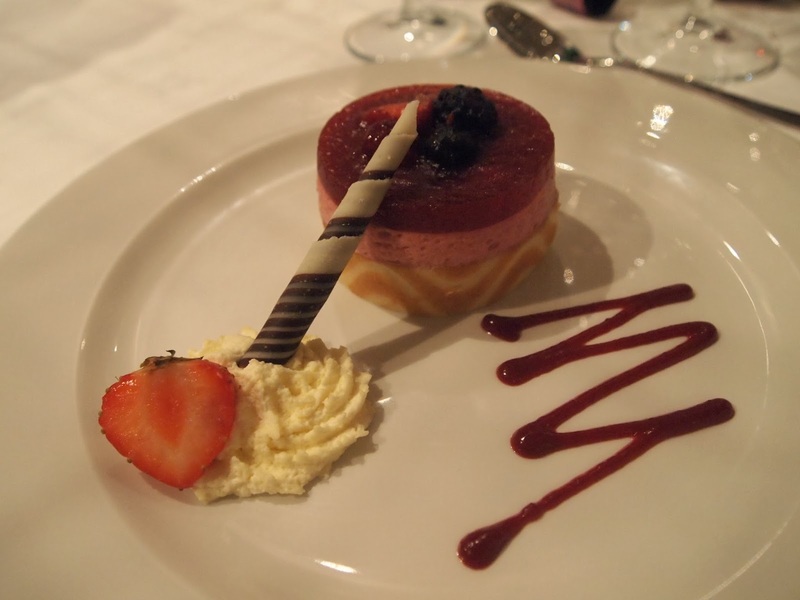 By the time dessert came, fruits of the forest delice (or in plain English cheesecake with fruit), we were quite tipsy. which you all care about way more anyway. When the dinner had concluded, I followed my companions over to nearby Josephine Butler College where Jager bombs were the drink of choice. Charlotte bought a round of them, but I had reached my limit. I eagerly handed it off to one of the Sophies. The dance was going when we arrived back at Fisher House. The pub was jammed packed and we had to carefully maneuver through the crowd. We danced for a bit, but the music wasn’t precisely what I wanted to dance to. We ended up in the pub talking to a number of new people. Sophie and I met Robert from Ireland who was also doing our course. I remembered him from our induction on Monday, but none of us had really had a chance to speak before then. The night wore on and I began to feel my exhaustion and the exhaustion of a whirlwind of a week. Charlotte, Elena, and I walked back to Charlotte’s flat. My bus wouldn’t be coming until 1:30 in the morning and I had an hour to wait. We sat and ate cheese sandwiches and chatted about the differences in our Christmas dinners. Elena was from Italy and she explained about the different courses which were eaten and the fact that you were expected to stay at the table for nearly seven hours. I was grateful we didn’t have such lengthy meals back home. At 1:15 Charlotte and Elena walked me to the waiting bus. I waved goodbye and sat, totally drained. When I got back to my room I stumbled blindly in the dark. It had been an incredibly long day, but it was one of the best days I had had so far. I thought ahead to Monday and how I would begin my lectures and officially become a graduate student. How had I gotten here? I thought. It had been an incredible journey thus far.